The young warrior Ushiwakamaru, later known as Minamoto no Yoshitsune, was sent to Mount Kurama as a boy by his mother’s cruel lover, Taira no Kiyomori. There he learned the secrets of martial arts from the tengu, strange creatures who lived there under the sway of their king, Sōjōbō. Ushiwakamaru became skilled at fighting. 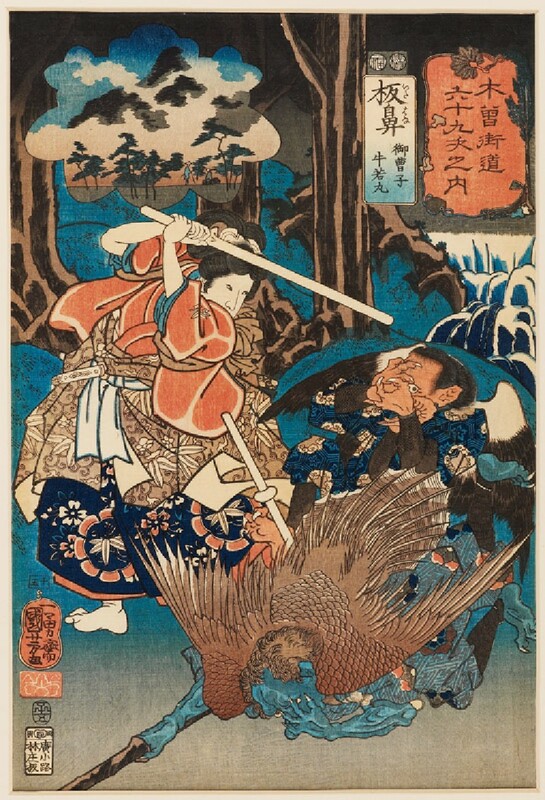 Here he is terrifying one long-nosed tengu, who covers his face, and another winged tengu who desperately tries to protect his beak from the blows of the young hero. 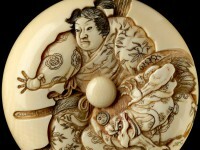 Minamoto no Yoshitsune is also depicted on the netsuke EA2001.108. Tengu are powerful mountain goblins. Two types appear in Japanese art, one with a long nose, and the other with a beak and claws. One identifying feature of both is a feathered fan.